When I was growing up, whenever I wasn’t feeling well my mom would make me chicken noodle soup. Okay, actually she would open a can of Campbell’s Chicken Noodle Soup, but the thought was the same–chicken soup feeds the body and the soul, right? I can still picture it! Me, all cozied up on the couch while Mom brings me a bowl of chicken soup. 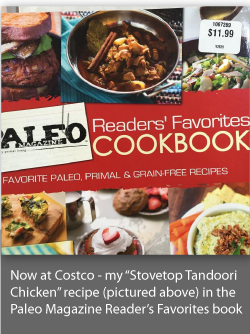 It tasted good to my young palate, was easy to eat, and was a comforting, soothing meal when I really didn’t want to eat anything else. Now that I’m a mom, I’m the one making the chicken soup. Canned soup just doesn’t do it for me anymore (and let’s be honest, it probably wasn’t all that nutritious anyway), but when I am under the weather, I still want a bowl of comfort and healing. 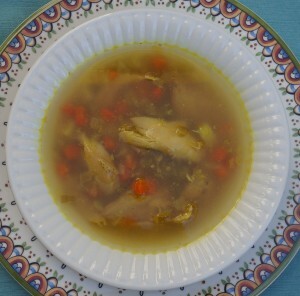 There’s a reason that chicken soup is called Jewish penicillin (and for the record, I did have a Jewish mother!). My version doesn’t have noodles, but I do add potatoes since I find that when I’m not feeling well I crave carbs and well-cooked potatoes always hit the spot for me. Omit them if you have problems with nightshades or are doing the 21DSD (they are fine for the Energy modification, though). This soup also relies on homemade chicken broth, which is easy to digest, healing to the digestive tract, and nourishing to a sick body–that’s part of why I call this my “tummy healing” soup. It tastes good, but is oh so easy to eat. I like to start my soup with a typical, traditional mirepoix. You can make your own mirepoix by dicing two parts onions, one part of both celery and carrots (I actually used roughly equal parts of each), or you can buy it pre-cut at places like Trader Joe’s or other grocery stores. I also include some not-so-traditional ingredients that have been proven to be excellent home remedies for the common cold. Plus, they add a ton of flavor! It’s easy to double the batch and freeze leftovers for future use. I like to freeze mine in 2-cup plastic containers so I have individual portions when I’m not feeling well. And this recipe is perfect for turning those Thanksgiving leftovers into something amazing! I hope you stay well throughout the cold and flu season, but if you’re in need of some warm, nourishing comfort, try this soup! 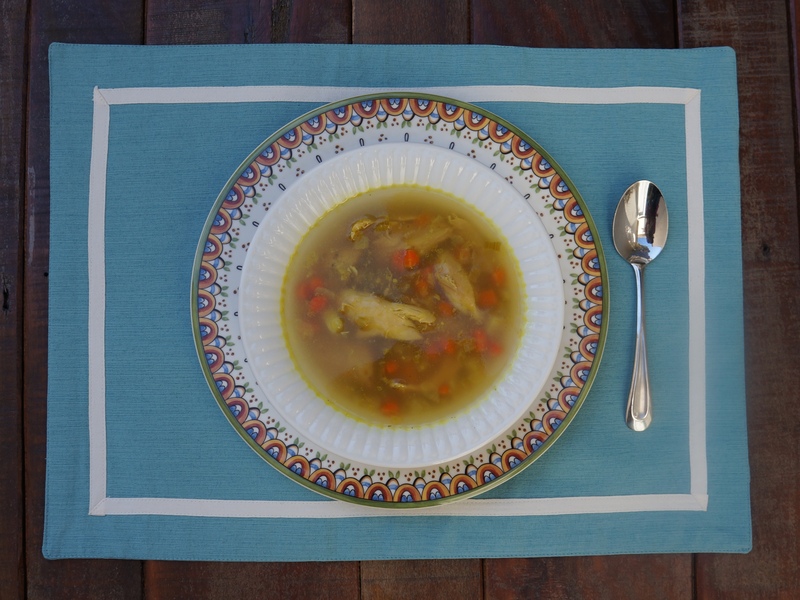 Healing, comforting chicken soup with a twist! If you are using precooked chicken, dice or shred it and set it aside. If you are starting with raw, bone-in chicken, preheat your oven to 400F and season the chicken with salt and pepper or whatever seasonings you like. Place the chicken pieces on a rack on a baking sheet and roast for 30-40 minutes or until the internal temperature reaches 165F. Remove from oven and let cool. While the chicken is cooking, prepare the rest of your ingredients. Put the peeled, diced potatoes in a bowl of cold water to keep them from turning black. Heat a large pot over medium heat and add the ghee or cooking oil. Add the mirepoix (onions, celery and carrots); stir well and let cook for about 5 minutes. Add the garlic and ginger, stir and let cook for 30 seconds, then drain and add the potatoes, salt, pepper, turmeric, chili powder (if using) and 1 cup of broth or water. Cover and cook for 5 minutes. Remove the skin from the roasted chicken (eat it while it's crispy or save it for a snack later!). Add the chicken pieces to the pot along with the rest of the broth and water. I like to leave the meat on the bone to add extra flavor and nutrients to the soup, but you could also take it off the bones and add it to the soup. Cover and let it simmer for about an hour or until the vegetables are soft and the meat is falling off the bone. If your broth is frozen (like mine was), defrost it in a saucepan while the chicken is roasting so that it is boiling or at least warm by the time you need to add it to the soup. Add a ½ tsp ground red pepper or cayenne pepper to the soup with the rest of the spices if you'd like some heat--this is great for sore throats or other upper respiratory colds.